When it comes to seafood restaurants in Hong Kong, the competition is pretty stiff. We do live next to the water, after all. There’s a plethora of excellent cooked food centres housed directly above our wet markets, as well as an eclectic array of high-end Chinese restaurants, specialist seafood havens, international joints that focus on fish and, well, much more besides. So the market for fruits de mer in our city is pretty saturated. Nevertheless, this hasn’t stopped Salient International Enterprises – owners of Bloop Shisha Lounge – from trying its hand at introducing seafood from the American South to the Hong Kong palate. Long communal tables line the dining room at new LKF eatery Holy Crab, with a large TV for sports on a wall and a rockpool that houses fresh produce that’s been flown in from the USA, meaning diners can look forward to species not commonly found in local restaurants, like dungeness crab and live crawfish. This already makes it stand out from its competitors. We start off with a fried okra salad ($80), which is an utter waste of time as it’s just a garden salad containing just a few bits of fried okra. A dull opener. And this vibe continues as next to arrive are the fried calamari rings ($178). The squid is crisp and dusted well with Cajun spices but again we’re not impressed because, for this price this should be excellent calamari and, frankly, it’s just fairly good. Fortunately, though, it all improves greatly when the bucket of crab arrives. 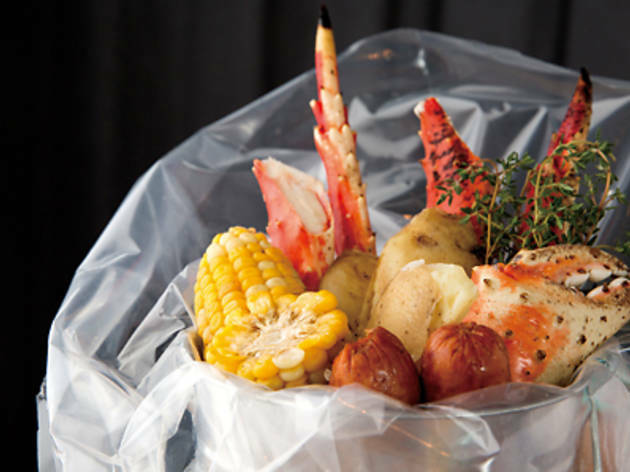 Cooked in low country boil-style, our king crab legs ($871, market price) come in a sealed plastic bag alongside corn, potato and andouille sausages – all immersed in a superb lemon pepper sauce. The process of eating this is a lot of fun, with everyone wearing bibs around their necks as the cracking of shells becomes almost rhythmical. The shellfish is meaty and juicy, with a piping lemony flavour and a clean black pepper spice. Word of warning, though: the Cajun spices build quick, so even if you find the Southern heat light at first, halfway through this meal expect your tongue to be burning. In a good way, of course. 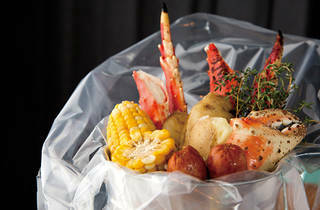 Holy Crab 3/F, Cosmos Bldg, 8-11 Lan Kwai Fong, Central, 2110 0100; holycrab.com.hk. Dinner for two: $1,200.